In Content Studio 5.7 we have added the possibility to create new documents or copy existing ones directly from the menu view in the Editor interface (aka. CSEdit). 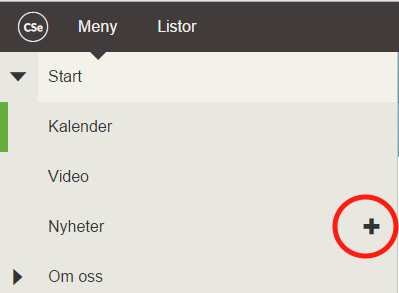 The image below shows a menu point (Nyheter) where you can add a new documents by clicking the + (plus) symbol. This is available for EPT documents only. In order to be able to create a document Content Studio must know to what list the new document should be added and whether or not the new document should be a part of the menu under the main menu item. This can be accomplished using the new "Associated lists" functionality in Content Studio 5.7. The idea behind Associated Lists is to connect a menu item to a list that can contain document that fit to the menu point, e.g. the News menu point should contain only items that are located in the News list. When the editor wants to create a new news document she does not need to specify the lists and thus the type of document that fits a news. This has already been done for her by the site developer. The developer can add more than one list to a menu item which means that the editor must choose which list to use. When this is the case Content Studio shows an interface that allows the editor to select the list. For example: the developer has decided that both the “Local news” and the “Foreign news” lists are eligible and will this be presented with a list of those two lists to select from. Further the developer can decide whether the new document should form a new menu item under the main menu item or just be a part of the list. In addition to this the developer can decide whether the newly created menu item in its turn will allow new documents to be created – inherited functionality. Associated lists cannot be managed through the editorial interface, the classic admin interface must be used. After logging on to the classic administrative and development interface (often /cs) locate the menu item document and select the “Document hierarchy” right click menu option. 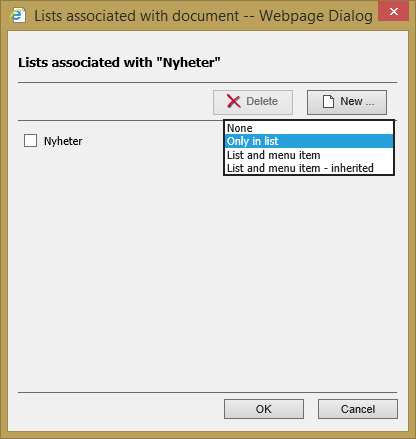 The document hierarchy dialog appears revealing the complete menu hierarchy where the menu item is a member. Each associated list appears with their name and their association property in relation to the menu item. The site administrator or developer set these properties according to the requirements of the site. New documents can be created in the list but will not be a child item to the menu item. New documents can be created in the list and will appear as a new child item as well. New documents can be created in the list and will appear as a new child item. The new document will also allow new documents to be as new child items and so on. To add a new associated list to the selected menu item just press the "New..." button. A new dialog appears that contains all lists of Ept documents – remember that only list of Ept-documents can be associated with at menu item. 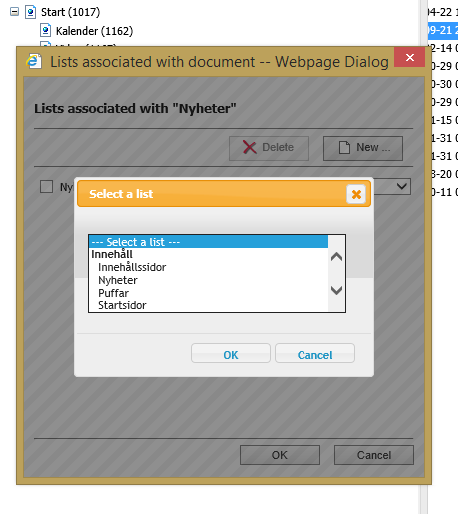 The dialog groups the lists after their given grouping as shown in the illustration. 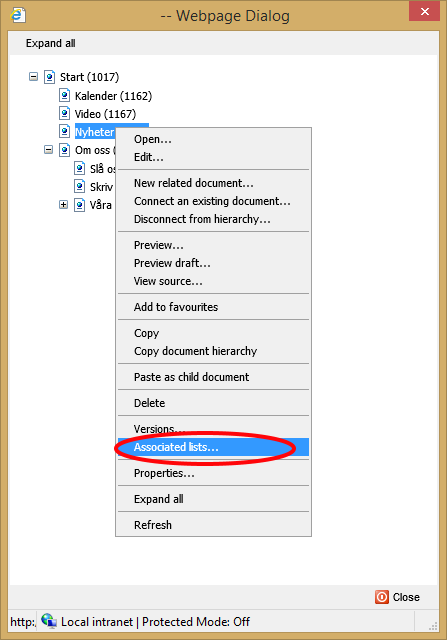 One of the properties of the list association List and menu item - inherited indicates that new items created as child items in the list will allow new child document items to be created and this behaviour propagates to their child items and so on. However as soon as any list association is created on a child document item, the inheritance is broken allowing that menu item to define its own set of rules. In order to be able to manipulate a menu structure from the editor interface the ordinary Content Studio permissions on the category, which is represented by the list, apply. In addition to this, rules specified by associated lists must comply as well. It is still possible to manipulate the menu structure from the classic administrative interface if associated list rules prevent you from doing that in the editor interface. The editor must have create permission on the parent document. The document must be part of a list associated with the menu document item being connected to. The association property must allow the parent document to create child documents. The editor must have delete permission on parent document. The document must be part of a list associated with the parent document. The association property must allow the parent document to create child documents. This rule exists to prevent the editor disconnect a document by mistake and not being able to reconnect it again. The editor must have delete permission on the current parent document and create permission on the target parent document. The document must be part of a list associated with the menu document item. The association property must allow the new parent document to create child documents.